Many people know me an “the man who makes useless machines” and even now I sometimes get requests for those objects, which I invented and built around 1933. In those days, the Italian nineteenth century reigned, with all its solemn maestri, all its art journals that spoke of nothing but lapidary artistic displays, and I, with my useless machines, was a laughingstock. And what’s more, these objects were made from cardboard shapes painted in flat colors, and sometimes a ball of blown glass, the whole thing held together with fragile wooden sticks and silk thread. The structure had to be very light to be able to move with the air and the silk thread was perfect for dispersing the torsion. But how my friends laughed, even those whom I respected most for the care that they put into their work. Almost everybody had one of my useless machines in their house, which they kept in their children’s rooms because it was considered a ridiculous and trifling things, while they kept the sculptures of Marino Marini and the paintings of Carrà and Sironi in the living room. Certainly, in comparison with a painting by Sironi, where you saw the lion’s claws, I with my cardboard and silk thread could not be taken seriously. These friends of mine then discovered Alexander Calder who made “mobiles“, but out of metal painted black or in violent colors. Calder immediately conquered the scene and I passed for one of his imitators. 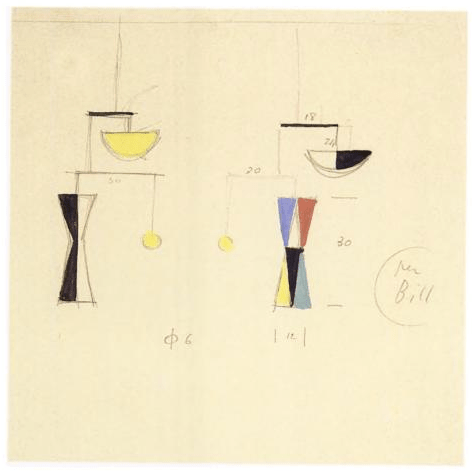 What difference was there between my useless machines and Calder’s mobiles? I think I should clear up this matter: apart from the fact that the material construction was different, the means of constructing the objects was also different. The only thing they have in common is that they are suspended objects that move. But there are many suspended objects and there always have been, apart from the fact that even my friend Calder had a precursor in Man Ray, who in 1920 constructed an object on the same principle. I just discovered, thanks to today’s amazing Google Doodle dedicated to Calder, this very interesting book about Bruno Munari, one of the few translated in english. I now have to read it, since from what I see in the previews on the web it looks like very interesting with more than 400 illustrations. This is just another good occasion to notice how three people in the same period worked on the very same idea at the same time, and also how different communication (maybe, triggered also from the material of the sculptures) triggered a very different perception of the objects: metal and vivid colors are sculptures, while cardboard and pastel colors are just a child toy. If you are interested in Munari’s Useless Machines / Macchine Inutili, on MunArt you can find a great page about the them by Munari. It’s in italan, but with lots of illustrations.